...that's all I have to say about that. ahhhh! I can't believe that! My boyfriend spilled oil paint in drips all over our rug AND spilled a whole bunch of ink. He managed to get the paint out but the ink was a lost cause. I don't think we're getting ours either :) I hope you have fun at the museum! oops! perhaps blue and black spills on top of the red to help mask the blunder. Ruh-roh! At least the color is beautiful! Oh no!! 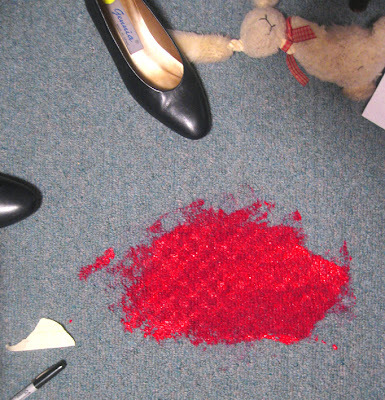 You could always spill a bit more of the hot pink spots all over the carpet..no? But, hot pink with blue and black...it's really hot for this season,do you never read interior deco magazines Tessa? !